We were made very welcome at Loddiswell Congregational Church by numerous members of the parish, who had come to hear our members play. They sat and listened to our impromptu performances with delight and made a very acceptable tea for us. 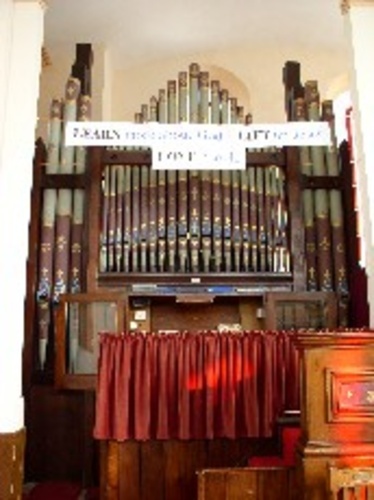 The present organ was built in 1899 by H. C. Sims of Ryde, Isle-of-Wight and was installed in Kingsbridge Congregational church, which was bombed in January 1943. It was decided not to rebuild the church, and it was offered to Loddiswell. It was opened here on 13th June 1946 by the Minister, Rev. G. Isaac. It has two ebony and ivory tracker action manuals, the compass of which is Low C – A3, and concave radiating pedals, the new pedal board being fitted during a complete overhaul in 1976. Following this overhaul, it was re-dedicated on 15th September 1976, in memory of J. R. Nunn, who was the organist at Loddiswell Congregational from 1926–67. 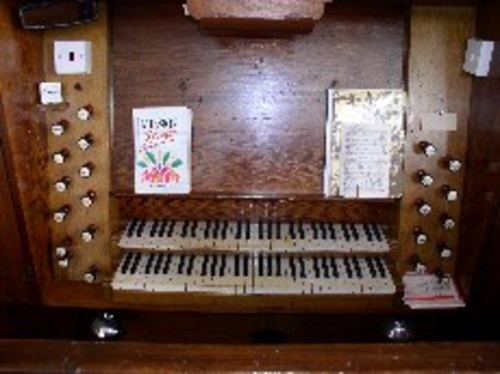 The organ has seven speaking stops on the Swell manual, seven on the Great and two Pedal stops, with the usual couplers and a tremulant. They are mechanical action draw stops with black knobs and ivory nameplates. The stop jambs are raked backwards.